DG: Yes, in their full gear. And I remember always just going “Lord!” and looking, yearning and being fascinated by them, their clothing. And then, in the early ’60s, in ’63, because I was seeing a lot of the early musicians, like Jimmy Page of Led Zeppelin, and we’d go to concerts with Ravi Shankar, Ustad Vilayat Khan, anybody, anything to hear Indian music. I’d been to India once before I’d been to Swami. So, I was already in love with the country. The moment my feet touched Indian soil, I knew I had come home. And you know for me, glorious Bharath is exactly that, glorious. 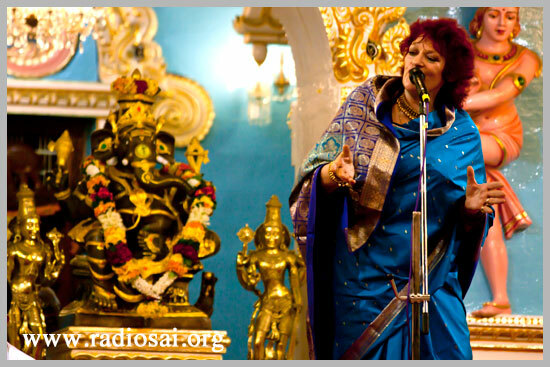 Swami once was asked, “Why is it that the Vedas are sung here? Why are only the great leaders, spiritual leaders, born in India?” and He had said, “Because only in India do they know how to live the message of the Vedas.” I mean, you’re not going to find some sort of saint being born in the outer suburb area of London or in Detroit. It just doesn’t happen. It’s because this country is so special. RS: It’s very interesting, you said, as a little girl, you used to watch the Maharaja and Maharani of Jaipur. I think perhaps somewhere there in that little girl’s heart, there was an admiration for the regalia they wore, because in later years, Swami has decorated you with a lot of gifts which have a very strong Rajasthani flavor. DG: Maybe. I love color. Nothing is more boring. I don’t do grey, for example. You haven’t seen me in any. Or browns. Because it’s not my way. I love splashes of color. I’ve always been colorful when I came here. He did once give me eight beautiful sarees in a week. DG: Well, He often would come backstage, just to see that the dupatta was pinned properly because you know, with all my movements, you can’t have this thing flying off, everything had to be and it still is covered. And rightly so, actually. But you know, I didn’t know what I was doing. I was quite capable of rushing out and forgetting that I should put a dupatta on, because I always feel in my soul that I’m a bit like a Labrador puppy that wags its tail, knocks things over, and is happy to talk to and see everyone. There’s nobody that I don’t love because I love everyone, everything, even if people don’t like me, I love them. So, that’s alright. So, it’s just this kind of happy state, I’ve always been a bit like that. DG: Yes, I did. Well yeah, I was called… to that little room at the side by the old kitchen, not His interview room and there He gave me a stack of sarees. But one of them was the one I wore for the 80th birthday. It was about 5 years before this. He gave me this thing that weighs a tonnage. It’s heavenly — rainbows and gold. He put it into my hand and it was so heavy I dropped it. And our Lord was down on the floor, picked it up faster than I could get down and I move pretty fast. And I knew as He gave it to me that I should wear it for the 80th birthday. I just knew it. Sometimes, you know things. RS: Intuitive knowing, it’s very clear. DG: And I’m grateful when He gives me that because every time I thought I’ve known it, I’ve made some terrible blunder. But when I really take time to listen inside and I know it’s Him, then you can’t make a mistake. And it’s our duty as humans to tune our inner radio channel to the radio receiver, you could say, to the best channel, because when we’re in tune with Him, we then get the best programs back. It just makes sense. DG: Fabulous. It was great. The first time was about nine years ago. And in fact, I was about to arrive with my own musicians and two days before with my ‘Mirrors of Love’ album. We used to perform in the Poornachandra Hall as well when it was empty. And I’d be sort of sitting facing them and they’d all be facing the curtain, as they were wise to the fact that Swami might have turned up. I didn’t know about that. And they’ll be playing away and suddenly all the music would just sort of peter out and stop and I’ll turn around and He’d be peeping through a crack in the curtain, sometimes He’d be peeping down there, sometimes just a little bit of hair would come through and then, they just sort of stopped. So, this was great experience. So, the boys were told. And I had to tell the house because things were prepared, everything was polished, clean, and the silver was brought out and there was a table, laid out with, you know, about 15 plates of savory stuff and 15 joyous bowls of payasam, which I’m mad about. And I’d been worried about how they were going to learn this in time, because this was absolutely not the style of music that they did. 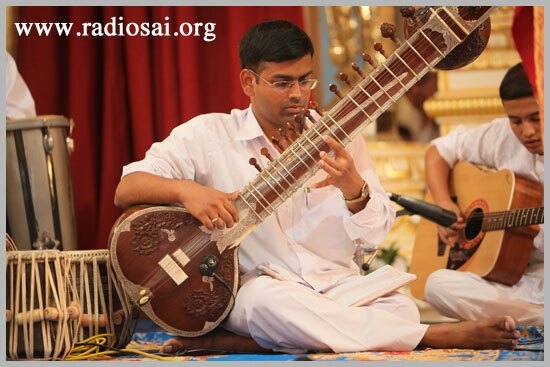 And in fact, Sai Prakash was on sitar and this was early days of his playing the sitar. He’d only been playing for two years. Swami used to make him play before the bhajans in the afternoon. And I’d been saying to the lady of the house where I stayed, I said, “You know, I do not know how this sitar player’s going to do. I mean, he’s really not on the board. It’s never going to work.” And this used to bother because the other instruments were somehow merging in. So I said, “Well, Swami, he’s really trying very hard. He’s practicing very hard” was all I could say. But I actually thought He’s going to be pretty out of tune on the day and I hoped nobody could hear him. Then, there was a row of chairs and Swami was sitting down. Suddenly, Sai Prakash, (the student playing sitar) went into the other room and came back with a little silver pot of cloves. And He looked up at Swami with such love in his face that it really stunned me. I have read and I know somebody had said that if you really want to see Sai Baba, you look at the love in everyone else’s face and there you can see the Lord. And I looked in Sai Prakash’s face and I remember thinking at that time, “This look is so amazing! I don’t care if He hasn’t even got any strings on his sitar, it’s worth it for that look alone.” Actually, he was fabulous on the night and everyone played perfectly well. DG: Yeah, but he landed up perfectly. But, this was a great experience. So, I’ve had the boys come and play with me for I think about six times. RS: I’m sure it was a great learning experience for them to work with you. DG: Yeah, and for me to work with them too, especially at the 80th birthday. I’d told everyone, “Please put up a tent over the place where the musicians play” and they all said, “No no, it’s not going to rain.” I said, “I know it’s going to rain.” So, they put a shamiana on, but only for people who played were sitting down and I stood out in the rain, got rained on, and they sat under the cover. But these boys… I’ve been honored to work with them - the dedication, the staying up late at nights - they’re working on their drama thing and they’re working on a load of other things. I learn from them too. It’s a joy, it’s an honour. RS: Dana, you are so passionate about Swami and His teachings and your love, it just comes through in everything you say. And yet, for some of us, it’s very hard to make sense of the fact that you perform your music in places which are quite dark. RS: And where people are not generally contemplating upon God — in a club or a pub where you’re performing. How do you reconcile the two? DG: Well, because I love everyone. I adore them. You know, I’m singing in places where, let’s face it, half of the audience might be completely drunk and a lot of them might be smoking cigarettes. But if you’re sorry for people that don’t have the joy of knowing about Him, the least I can do is uplift them a bit with blues music and if they’ve come out of that saying, “God! That was a really great evening!” even if they’ve had a few beers, then, job done as far as I’m concerned. And I’ve always liked Swami’s description about in the morning, when the sun rises over the water lily pond, not every flower is out. This is how I see the audience. Swami said, “No no. Nobody is more close to Me than anyone else is close to Me. Everything is equal.” And this is how we have to be, non-judgmental. You know, I’m a little funny with alcohol because I hate alcohol personally and I’ve always hated it even as a child. That’s the old Muslim of me coming out. So, I don’t quite know drunkards are going to react. I’m a bit nervous. But, if they’re enjoying the music, then, I’m giving them some pleasure. So, I’ve sung in appalling places, but blues music is good music and it’s honest music and it’s spiritual music. So, if one man in there goes home and thinks, “I’ve had a great evening”, even if he’s not thinking of God, one day, he will and one day, his lotus blossom heart will be opened. So, I’m just entertaining him till he’s ready. 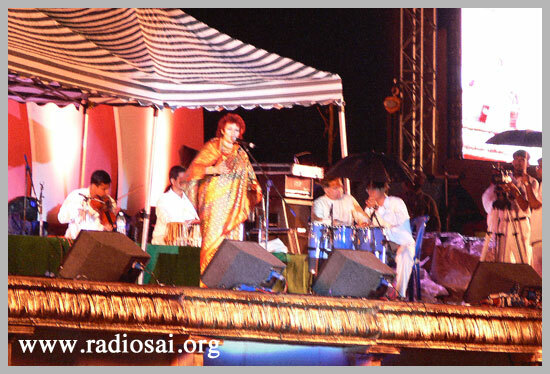 RS: When you’re performing, in your heart, are you thinking of Swami while doing it? DG: Often, yes. Well, if I think that maybe it’s going to be a difficult audience, or it’s going to be… maybe it’s a huge outdoor beer festival, sometimes we have to do these things, because my musicians have to eat, we all have to earn our living and I think it might be tricky. What I usually do is I imagine Swami’s hair like a big umbrella over the crowd so there’s sort of a black cloud. So, it always goes better. My musicians aren’t devotees. But, I sing songs… a lot of the blues, it’s a bit like a ghazal. If you’re young, you can think it’s physical love you’re singing about. If you’re older, you realize it’s divine love. And blues is exactly the same. DG: Yes. Absolutely! So, they might think I’m singing about… it’s like I said that song I sang “Your love is true” a few days ago. RS: The other day in Bhagawan’s presence. DG: They’re all thinking I’m singing about some mere mortals, I guess. But I know who I’m singing about and I know who I’m writing about when I write. So, sometimes if I can get a line in like in “I sigh for you, I can get if I take one step to you, take 10 steps to me”, well, every devotee’s gonna know who I’m singing about, which is what I did in Singapore. 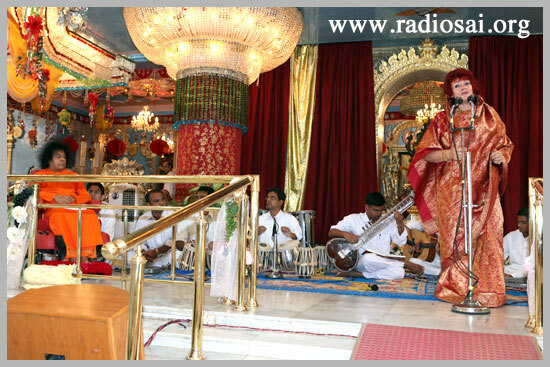 There were devotees dotted around this audience. So, they know lines like “Why fear when I am here?” or “Love all serve all” might be slipped into a song or “Soham”, they would think I’m probably singing a word they’ve never heard of. It doesn’t matter. So, I have a good time and I know what’s in my heart. RS: And when you sit to compose your music and write your songs, it’s always God you have in mind, Swami? DG: I suppose it is but I don’t think of it as clinically as that. Sometimes, a melody might appear from… could be from a car horn or a cat meowing. Suddenly, I get an idea or I might hear a beat. Usually, I write when I’m in Italy. I spend a lot of time there, when I’m not in London. In London, my house is too full of telephones, there’s a television there, there’s electrical wiring. And it’s a very small house. Swami once said to me, “You live in a tiny little house”, He said, almost like that. But, I’m aware that London is masses of static energy and I don’t write well. I go to Italy and I’ve got 180 degrees of sky and it’s peaceful. You get a germ of an idea and then you work around it. And I’m often thinking of… I don’t really think of it as God. It’s just a idea people might feel good listening to. DG: Positive, yes. Mostly I sing ‘up’ subjects and I just want people to feel good. That’s my duty on the planet and it should be everyone’s duty, you know, to make everyone else feel good. But I had a mother who instilled these amazing things. My mother was full of wisdom, always saying pithy sayings like “Blessed is He that expecteth nothing, for He shall not be disappointed”, stuff from the Bible. She used to drive the car, taking me to school, singing hymns at the top of her voice. DG: The good news! He’s here, you know, I must tell you about it. They said “You’re out of your head.” The only ones that believed me were my parents. They said “We know you and if you’ve seen something, we believe you.” My parents had remarried. So I had two sets of parents, they were both great. My stepfather’s fantastic. My mother said… he wanted to go. So, I accompanied them. Within the first year, I came three times — once alone, with my father’s wife, and then my mother and stepfather. My mother came after her husband's passing; he was 10 years older than her. She was in tears a lot. And Swami didn’t talk to her - I think she was too fragile emotionally. And I’ve noticed too that He wants us strong and He makes us strong from far off, sometimes. So, the second year after my stepfather died, my mother was stronger. But then, we were called in and we had quite a few interviews together, and I often would sit very close so that I could interpret, because sometimes my mother wouldn’t know what ‘Abhishek’ meant or things like that. And she had quite bad arthritis which you know of course I had gotten and He stroked her hand. I went, “Swami, I’ve got it too.” And He’d gently push my hand away and go, “I’m dealing with your mother now.” I mean, He’s got such a way. But He wants us to be happy. And my mother was happy at the end. He said to her, “What’s your religion?” and she was quite surprised by this question. She said, “Church of England”. He immediately gave her an amazing crucifix. He was great with her. "I don’t know what He is." RS: You’ve known Swami for 30 years. You’ve performed for Him. You’ve integrated Him in your life, which for many, is very divergent from a spiritual path, because you’re in a business that involves glamour and money and entertainment. 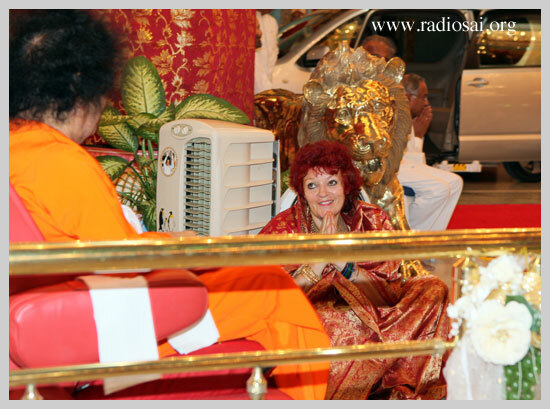 At the end of it all, how do you relate to Bhagwan Sri Sathya Sai Baba ? DG: The more I come here or the more I think about him when I’m traveling or at home, I realize that I know absolutely nothing. I mean, I can talk till I’m blue in the face but I know nothing about Him. And I now know that the emptier I am of having no desires and not wanting anything is by far the best way to be. I just have to try and hope that the things I do are the right things and that they are guided by Him. I don’t really want to mess up any more than I have done in my past. But we all learn probably the worst mistakes are our best learning curve. I don’t know what He is. You know, many people who come here all say they feel His presence so much more when they go back home. I’m talking about the Westerners and probably a lot of Indians. And I think this is a good thing, because we have to realize the body is so unimportant, His body or any of our bodies. In the end, it’s unimportant. It’s the spirit and it’s His message of love. And this is the thing… there’s so much literature on Him and I’m always happy when the Sanathana Sarathi drops on my doorstep. Often when I’m on a bus or a plane I suddenly catch the glimpse, I think I’ve seen Him over there. And then, I see, no, it’s just a bit of orange and black above you on an advertising board or something. But I see Him often but not like He looks. It’s not that, it’s not Him. But, He’s always in the back of my head and even as we are talking, or if I’m talking to anybody, I’ve got in the back of my head, “Swami, Swami, Swami.” It just keeps going on in the back of my head. And that’s the name. That is how I speak to Him – as ‘Swami’. Some people say ‘Baba’. I just keep asking “Swami, please guide me. Is this the right thing to do?” If I get offered a job, and I look in my book, should I take this and I will think, “Is this ethically right? Swami, help me.” And I think, I hope that He gives me the right decisions. But, if they’re interested, I try and explain about the second reincarnation, there’s a third one to come. And if I see them glazing over, they can’t take that information, I back off a bit. But, I try and talk to people as they can understand it. Mohamed himself said, “Only speak to people at the level that they can understand.” And, you know, from a leaf to a snowflake being all over the world completely different, how amazing this is. We are all one. And when you know this, and when you know it, not just read it, but you actually know it, and it’s in your selves, you function differently. I mean, I don’t function through life as I used to 30 years ago. But I’m also aware that He could take this feeling away. Any moment, I could be slung back on that heap of non-understanding, the Sufis call it a state of contraction and expansion. And I’m aware that pride will be a terrible downfall, pomposity the most awful one or thinking you know anything - terrible. These are for me the sins that would destroy me. And so, I could be back down there in a state of absolute non-grace. I don’t take anything for granted. If I feel this way is joyous, it’s because He’s given it. There’s nothing I’ve done. I don’t do anything. I just sit here and chat away. 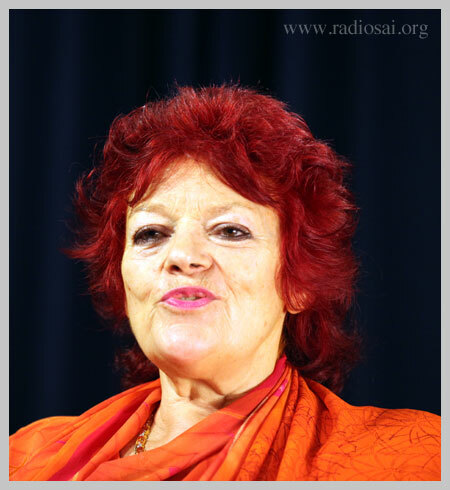 RS: Dana Gillespie, it’s been such an honour to listen to you and have this conversation with you. Thank you for sparing us your time! DG: Well, thank you. It’s been a great honour to sit and talk to you, Karuna.